When my web host had a brief outage I decided to move my site to AWS. Since I'd been working with various AWS services recently, I decided that some automation would be nice as well. I found it surprisingly difficult to find a plain explanation of setting up hug and apache mod_wsgi. So here is how I did it. Whenever I want to test a new release of Ubuntu I find myself cloning the root partition so I can safely upgrade and still keep my old install. After my old WordPress setup broke one time too many I finally decided to convert the site to something nicer to work with. I ended up going with Pelican, which is a static site generator using Python. I have a mostly-headless HTPC without keyboard, so it is easier to control it remotely. VNC lets you do anything, but for simple things a command line is faster. I wrote a simple natural string order comparison function in C. I later found out I basically reimplemented (a part of) Martin Pool's strnatcmp, so I renamed mine that as well. Update: Updated below for 11.04/Natty. So I had some trouble getting grub-reboot to work, since it only seems to like numbers, but I figured it out. I made a script to reboot to another kernel or OS (Windows for me) once, leaving the default unchanged. The encrypted home directory feature of Ubuntu is especially useful with laptops, where if it is lost one probably doesn't want others to have access to data. Unfortunately it messes up ssh access with public keys. I recently moved to Chromium - the open source version of Google's Chrome browser - after I grew tired with Firefox crashing and bloating my system. Just uploading this short note/paper here in case anyone ever finds it useful and so I won't lose it again. I wrote this last year, during the summer as I worked on networks. One of the changes in the recent Ubuntu 10.10 (Maverick) is the upgrade of Linux kernel from version 2.6.32 (in Lucid) to 2.6.35. The change introduces several new features of which I especially like Radeon power management (for use with open drivers). In looking for a data structure for a memory management problem I tried to find a self-balancing tree that would use as little space as possible. The only one I found from Wikipedia that didn't require any additional information at nodes was the scapegoat tree. 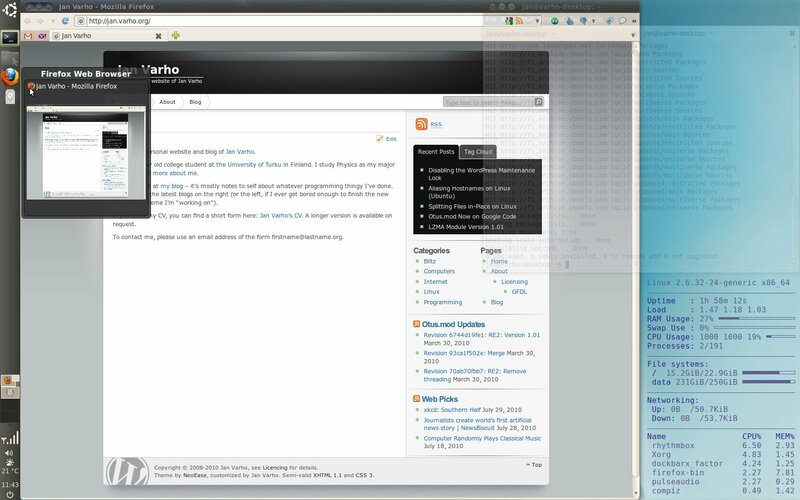 To make the wireless of my 1001PX work in Ubuntu Lucid I had to install the 2.6.35 kernel from Kernel team PPA. The package name is linux-meta-lts-backport-maverick and it should eventually become available in the Lucid package archives. I finally have Ubuntu Lucid looking like I want it to. First a couple of screenshots and then some linking to the relevant packages etc. 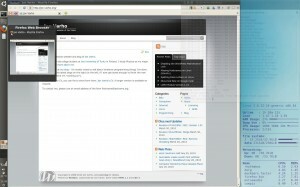 Here's the desktop with Firefox open. Just delete the .maintenance file is the WordPress directory. When Googling for hostname aliasing on Linux, the most prominent answers were for SSH hostname aliasing, which is simple. For a general purpose solution the common answer was "install a DNS server", which is way over the top. Here's what I managed to figure out. I have finally moved to using Google Code and Mercurial distributed VCS for my "Otus.mod" BlitzMax module collection. I updated the module to use version 4.65 of the SDK and a small refactoring in the wrapper. Next up will be version 9.x (beta) and LZMA2 support. The code for my table generator for 5 card poker evaluation is included. It is a BlitzMax file, which requires the "Cactus Kev's Evaluator" to run. Another evaluator can be used instead with some rewriting of code. With KVM you can use a high resolution by passing kvm the -vga std parameter (or -std-vga before KVM-77). When using virt-manager to manage virtual machine guests, there is no option to change display resolution. However, it is possible to work around it as follows. This is an experimental version of a threaded remote actor module for BlitzMax. It extends the features of my actor module with server and client actors, which pass messages through a network socket. It should allow increased parallelism for an actor based program with very little added complexity. Implementation of the actor model for BlitzMax, updated version 1.20 with better thread management and more robust locking. Works both threaded and non-threaded, though there are obviously some differences. Methods and types state when they are threaded-only. Requires a fairly recent version of BlitzMax. Implementation of the actor model for BlitzMax, updated version 1.10 with better thread management. Works both threaded and non-threaded, though there are obviously some differences. Methods and types state when they are threaded-only. Requires a fairly recent version of BlitzMax. Here's an object oriented file system interface I've been using for my own projects. It's a module with source and Windows binaries. It is complete with TStream support, including OpenStream interface. It should be pretty intuitive and also includes docs. Synchronized list and map data structure modules for BlitzMax. Just a simple mutex-locked wrapper over the BRL types to make operations atomic. Should be compatible with old code. As promised, here is a BlitzMax module based on my LZMA module that handles automatic compression of streams. By using it reading and writing compressed files is as easy as using "lzma::" as a prefix to OpenStream. I wrapped together a BlitzMax module for LZMA compression. It is based on LZMA SDK (version 4.62) and only has a BlitzMax wrapper written by me - the rest is someone else's work. It is completely in the public domain. I've pulled together a first alpha release of MaxPre - a preprocessor for BlitzMax. I've been using Firefox 3 since the first beta and it's a very good and quite stable browser. However, there's one "enhancement" that bugs me a lot. And that is the history+bookmarks combination that they call "Places". In connection with another project of mine, I produced a BlitzMax module that allows writing and reading arbitrary objects to streams. It can also be seen as a generalization of ReadInt, WriteString and the rest. It should be useful for saving game states or creating an undo feature.